Identification: Scott and Crossman (1973); Becker (1983); Page and Burr (1991); Etnier and Starnes (1993); Jenkins and Burkhead (1994). Native Range: Most of eastern Canada from Newfoundland to western side of Hudson Bay; south in Atlantic, Great Lakes, and Mississippi River basins to Minnesota and (in Appalachian Mountains) northern Georgia (Page and Burr 1991). Table 1. States with nonindigenous occurrences, the earliest and latest observations in each state, and the tally and names of HUCs with observations†. Names and dates are hyperlinked to their relevant specimen records. The list of references for all nonindigenous occurrences of Salvelinus fontinalis are found here. Means of Introduction: This species has been stocked for sportfishing since the 1800s. It was first stocked in Arizona in 1920 (Rinne 1995). It was stocked in Missouri from 1879 to 1914 (Pflieger 1971). Status: Established locally in many areas. This species is native to portions of the Great Lakes basin, but non-native in some inland lakes of the basin. Previously established in Soda Butte Creek in Yellowstone National Park. Extirpated via rotenone treatments in 2015 and 2016; currently monitoring and eDNA testing (Ertel 2018). Impact of Introduction: In Black Hollow Creek, near Fort Collins, Colorado, stocked Brook Trout completely replaced greenback cutthroat trout O. clarki stomias within a period of five years (Behnke 1992, U.S. Fish and Wildlife Service 1995). 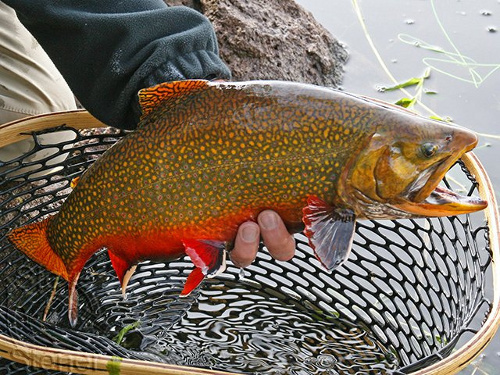 Brook Trout also have replaced Lahontan cutthroat trout Oncorhynchus clarkii henshawi in areas where the cutthroat is native and Brook Trout have been introduced. Introduced Brook Trout, and other trout species, were likely responsible for the near-extinction of Lahontan cutthroat in Lake Tahoe in the 1940s (McAffee 1966b). Becker (1983) hypothesized that Brook Trout may have been responsible for lack of success in establishing grayling populations by stocking because of the Brook Trout's more aggressive nature. Introduced Brook Trout inhabit approximately 40% of bull trout S. confluentus streams in Montana and may be replacing native bull trout in that state through hybridization. Almost all the resulting hybrids are sterile. Bull trout are now a species of special concern in Montana (Holton 1990; Kand et al. 2002). Introduced Brook Trout are known to replace native golden trout O. aguabonita (McAffee 1966a; Moyle 2002). Introduced predatory fishes, including the Brook Trout, are likely at least partially responsible for the decline of the Chiricahua leopard frog Rana chiricahuensis in southeastern Arizona (Rosen et al. 1995). Remarks: A popular sport fish, especially with fly fishermen. Tyus et al. (1982) mapped the distribution of Brook Trout in the upper Colorado basin. Loyacano (1975) lists Brook Trout in the Santee-Cooper and Savannah drainages in South Carolina but does not indicate that it is introduced. Rohde et al. (1994) do not show it in the Santee-Cooper drainage in South Carolina. Swift et al. (1986) listed it as native to the Savannah (South Carolina/Georgia), Chattahoochee (Georgia), and Coosa (Georgia) drainages. Hocutt et al. (1986) listed it as native but possibly introduced to the Santee drainage (SC). Etnier and Starnes (1993) listed the native status of this species as uncertain in the Conasauga (Coosa) system. Underhill (1986) listed it as native to Isle Royal in Lake Superior (Michigan). Stauffer et al. (1995) listed this species as native to the Kanawha below the falls, and as probably present and native to the Little Kanawha drainage in West Virginia. Starnes et al. (2011) state that Brook Trout were present in some headwaters of the Difficult Run system (Potomac River drainage), listing it as possibly non-native, but is now extirpated from the region. Neville and Bernatchez (2013) examined the population genetics of Idaho river populations and available hatchery strains, finding a large degree of genetic structuring both within and among river populations, and a high degree of likely admixture of hatchery strains in the wild. These genetic data also showed that while the sampled hatchery populations were the likely origin for most Brook Trout in Idaho, a substantial portion were derived from an unknown genetic origin; this genetic mixing of Brook Trout strains likely increased the diversity of founding populations, and enhanced establishment and invasion success. Koenig et al. (2015) examined the ability of stocked Tiger Muskellunge (Esox lucius x E. masquinongy) to reduce or eradicate Brook Trout populations in high alpine lakes in Idaho, finding >90% reduction in Brook Trout catch per unit effort in tiger muskellunge-stocked lakes with 0-1 inlets or outlets. Fact sheet and distribution map for splake [Salvelinus fontinalis x namaycush] is available here. Becker, G.C. 1983. Fishes of Wisconsin. University of Madison Press Madison, WI. Delong, J. 2002. Nevada Focus: stocked fish upset Lake Tahoe ecosystem. San Francisco Chronicle. Associated Press. August 6, 2002. Ertel, B. 2018. Preservation of Native Cutthroat Trout in Northern Yellowstone. https://www.nps.gov/articles/preservation-of-native-cutthroat-trout-in-northern-yellowstone.htm. Accessed on 04/23/2018. Griffiths, F. P. 1939. Considerations of the Introduction and Distribution of Exotic Fishes in Oregon. Trans. Am. Fish. Soc. 69:240-243. Hocutt, C. H., R. E. Jenkins, and J. R. Stauffer Jr. 1986. Zoogeography of the Fishes of the Central Appalachians and Central Atlantic Coastal Plain. In C.H. Hocutt and E.O. Wiley, eds. The Zoogeography of North American Freshwater Fishes. pp. 161-212. Kanda, N., R.F. Leary, and F.W. Allendorf. 2002. Evidence on introgressive hybridization between bull trout and brook trout. Transactions of the American Fisheries Society. 131: 772-782. Loyacano, H.A., Jr. 1975. A list of freshwater fishes of South Carolina. Bulletin of the South Carolina Experimental Station 580:1-9. McAffee, W.R. 1966a. Golden trout. Pages 216-221 in Calhoun, A, ed. Inland fisheries management. California Department of Fish and Game. Sacramento, CA. McAffee, W.R. 1966b. Lahontan cutthroat trout. Pages 225-231 in Calhoun, A, ed. Inland fisheries management. California Department of Fish and Game. Sacramento, CA. Mecklenburg, C. W., et. al. 2002 Fishes of Alaska. Amercian Fisheries Society. 1037 pp. Moyle, P.B. 2002. Inland fishes of California. Second edition. University of California Press, Berkeley, CA. Schofield, C.L., D. Josephson, C. Keleher, and S.P. Gloss. 1993. Thermal stratification of dilute lakes-evaluation of regulatory processes and biolgical effects before and after base addition: effects on brook trout habitat and growth. USFWS Biological Report. 1993(9). Tyus, H.M., B.D. Burdick, R.A. Valdez, C.M. Haynes, T.A. Lytle, and C.R. Berry. 1982. The fishes of the upper Colorado River basin: distribution, abundance, and status. Pages 12-70 in Miller, W.H., H.M. Tyus, and C.A. Carlson, eds. Fishes of the upper Colorado River system: present and future. Western Division, American Fisheries Society. Bethesda, MD. Underhill, J.C. 1986. The fish fauna of the Laurentian Great Lakes, the St. Lawrence lowlands, Newfoundland, and Labrador. Pages 105-136 in Hocutt, C.H., and E.O. Wiley, eds. The zoogeography of North American freshwater fishes. John Wiley and Sons. New York, NY.